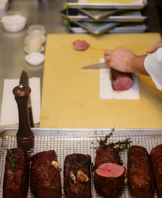 Chef Services Group can provide your establishment with the guidance to create and develop a fully equipped and operational Cook Chill Production / Sous Vide System. The purpose of this summary is to highlight the advantages of creating a central commissary production system. The ideal food environment for this production format is one with high volume. It should be evident that your operation will meet this criteria if your operation is more than one restaurant location or contains multi-faceted food service environments. The duplication of food production exists all over the food preparation board. For example the production of sauce, soups, salads, cold cut slicing, vegetable cutting could all be eliminated from duplication / redundancy with the installation of a central commissary kitchen. Lower food cost by increasing yield of liquid and pumpable food items. Build an inventory with a 30 day shelf life. Reduce operating labor costs by 35% or more. Use of numeric formulas and incorporation of functional ingredients such as modified wheat flours and all natural and organic hydrocolloids to insure proper viscosity and stability. Cook Chill Production Systems are used by many types of food service organizations including Fine Dining Restaurants, Fast Food Restaurants, Restaurant Chains, Hospital Food Service Departments, School Food Service Departments, College University Institutional Food Service Departments and Caterers. These organizations produce large quantities of consistent ‘just made fresh’ foods using a Cook-Chill production. This provides products with an extended shelf life while achieving a reduction in food and labor costs and practicing hi-level, safe food handling. 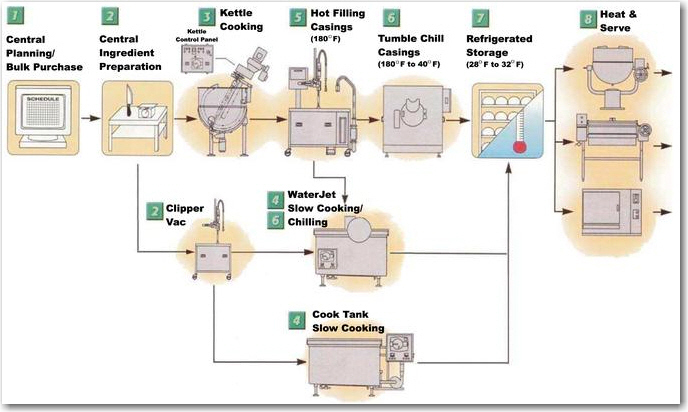 The Cook Chill Production System is a major advance in prepared foods technology that ensures consistent quality in every batch, at every location, while reducing labor required for preparation and serving. Like no other system now on the market, Cook-Chill can provide a high degree of quality and fresh cooked taste. Cook Chill Systems are used by many types of food service organizations including Fine Dining Restaurants, Fast Food Restaurants, Restaurant Chains, Hospital Food Service Departments, School Food Service Departments, College University Institutional Food Service Departments and Caterers. These organizations produce large quantities of consistent ‘just made fresh’ foods using a Cook-Chill production. This provides products with an extended shelf life while achieving a reduction in food and labor costs and practicing hi-level, safe food handling. The Cook Chill System is a major advance in prepared foods technology that ensures consistent quality in every batch, at every location, while reducing labor required for preparation and serving. Like no other system now on the market, Cook-Chill can provide a high degree of quality and fresh cooked taste. Food is prepared on site or at a central location under highest quality control standards and cooked in volume. Upon reaching the exact degree of done-ness, that is above pasteurization temperature, food is filled directly into a 3mm food grade bag to ensure strict sanitation and insure extended refrigerated shelf life of up to 30 days. The bag is then securely closed with a heat seal system or clip closure. 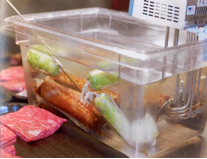 The sealed bag is immediately placed in iced water or tumble chiller to halt the cooking process and reduce the food’s core temperature to 36-38°F degrees. Food can be stored refrigerated or frozen. At the serving location, product can be reheated in several ways. The bag can be placed in a steamer, or simply immersed in hot water. An additional option for the re-therming process is opening the bag and pouring the contents into a kettle or serving pan to reheat the product. 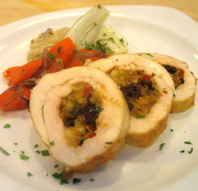 Aroma, taste, texture…the final presentation delivers quality, ‘fresh-cooked’ goodness. Basically any food of pump-able consistency can be cooked and prepared at peak quality with a Cook-Chill system. This includes soups, chowders, sauces, gravies, chili, stews, casseroles, pasta dishes, pizza toppings, and more. With Cook-Chill, once the raw ingredients go into the cooking kettle, the food is never again exposed to handling. The 3mm food grade bag is used for packaging, storing, distribution and reheating. This food grade material is heat stable and also prevents crossover of flavors or odors in distribution. The foods are packaged at above pasteurization temperature, and are not exposed to air until the bag is opened for serving. Each batch prepared with the Cook-Chill method is a “prescription” for freshness and quality. This centralized preparation enables food service operators to maintain absolute control over uniformity and quality. All recipes are precisely measured by weight and the cooking cycles carefully monitored. 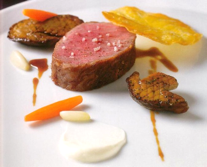 Foods are cooked to proper doneness, never over- or undercooked. Thus, every serving location, no matter how distant, is assured uniform flavor, texture and quality. Best of all, even after weeks in storage, the food taste as if it was freshly prepared. Cook Chill Systems are now in use at food service operators nationwide, aiding in the service of a broader variety of fresh-tasting foods with ease and consistency. Restaurant chains, are supplying a wide variety of soups and entrees to their stores. A leading Mexican-food chain, for example, is packaging everything from chili con queso to refried beans. Boston and Harvard University is a model operation supplying satellite locations on there campus from its central commissary, upgrading the quality of its “institutional” fare and realizing significant economic benefits in labor management and food service operations. A supermarket chain’s central commissary is efficiently supplying in-store delis with soups, chili and a variety of hot entrees. The system allows for more advanced scheduling of production, labor and raw material purchases. This allows for bulk purchasing, as well as saves costs and time. Cook Chill Packaging can be used for refrigerated or frozen foods. The 3mm food grade clear bags withstand temperatures ranging from -20°F to 212°F. Savings in labor can be substantial, since highly skilled personnel (dietitians, chefs, etc.) are needed only at the central kitchen. No trained cooks are necessary at the serving locations; even part-time employees with minimal training are capable of reheating and serving. And, because so few pots and pans are used at the commissary and serving site, cleanup requires less time. Storage and inventory are easier to handle, each package is identified by content and packaging date. The storage is stackable minimizing storage space requirements, therefore, deliveries can be reduced. Each satellite facility can maintain fresh inventory in its own cooler with assured 30-day shelf life from date of packaging. Contact CSG Today for Your Food Photography & Styling!